A Longwood Christmas begins Nov. 24. 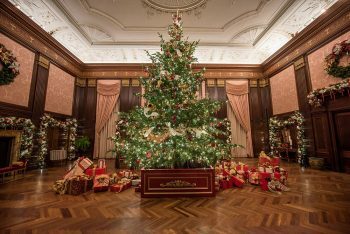 A Longwood Christmas rings in the holiday season with a musically inspired display November 24–January 8. Explore the warm 4-acre conservatory and be enchanted by more than 50 trees decorated for the holiday season, including an 18-foot revolving tree adorned with musical instruments in our grand Music Room, and a 30-foot tree composed of more than 1,300 poinsettias, ivy, and orchids. Outside, all eyes are on the sky as illuminated stars twinkle above, colorful fountains dance to holiday music, and a half-million lights brighten the night. Throughout the season, Longwood’s Ballroom will feature free and ticketed holiday-inspired performances as well as daily holiday sing-alongs performed on Longwood’s 10,010-pipe organ. The Olde Towne Carolers stroll throughout the Gardens adding to the holiday charm Thursday – Sundays, from 4:30–8:30 pm. Fountains dance day and night to holiday classics in the Open Air Theatre. Young and old will delight in Longwood’s outdoor train display as it travels past miniature Longwood landmarks lit for the holiday season. In Longwood’s historic Chimes Tower, the 62–bell carillon plays holiday music every half hour. For more information, visit longwoodgardens.org.